YORKSHIRE CARNEGIE’S record try-scorer David Doherty aims to shrug off the “shock and disappointment” of his exit from the club by throwing himself into a surprise new dual-role as Harrogate’s director of rugby and commercial director. The ex-Sale Sharks and Wasps winger, who has amassed 49 tries in 107 games during two spells with Carnegie, was told he would be not offered a new deal with the Championship high-fliers for 2016-17. At 29, he has scored eight times in 18 games this term and admits he was stunned by the news. 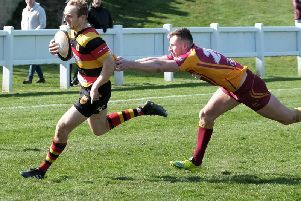 Doherty, who could still figure in their Championship semi-final second leg at Doncaster on Sunday, has quickly sorted his future by agreeing to join National Two North Harrogate. “I’m absolutely delighted to become Harrogate’s director of rugby and commercial director,” he said. “I can’t wait to get started and have already begun. “I always liked the idea of coaching and wanted to do it after my playing career – but I just thought I’d be at Carnegie for the next three or four years. “I’d played every game I was fit for this season, had some good results and was happy with my performances so I was very disappointed and a bit shocked I didn’t get another contract offered. There were a couple of offers from London sides but I really wanted to stay in Yorkshire. He will replace long-serving Mike Aspinall, who joined as a player in 2005, made 151 National League appearances and first began coaching Harrogate in 2007 but steps down at the end of this season to develop his business interests away from the club. Leeds-born Doherty is unlikely to continue playing despite still believing he has plenty to offer. “That will be up to the playing squad,” he said. “I don’t want to detract from the rugby role or leadership of the team and my intention is not to play. I am only 29 but have to make sure I’m looking after the team. If it’s the right thing to do for them I will do it (play). Doherty shot to prominence with Leeds Tykes by becoming the youngest player in Premiership history at 17 in 2004.